For those who are really serious about window tinting professionally, a tinting school will give you the best hands-on training. Especially with automotive window tinting, learning an experienced window tinter’s tips and tricks is extremely valuable. This article will explain what to expect from one of these training courses, as well as list some of the better schools to choose from. Although there are courses that will teach you flat-glass window tinting, automotive tinters are generally the ones who benefit from a hands-on training course. Because there are morse steps involved in automotive window tinting (cutting, heat shrinking, squeegeeing, etc.) it can be harder to pick up and learn successfully. If you are serious about tinting 5-6 cars a day for customers, you’ll want to be sure you can do it quickly and correctly. You won’t need to have anything before enrolling in the courses. Generally, window tinters who enroll may have tinted before and have some tools and film already, but it is not required. In fact, the course will educate you on which films and tools are best for particular applications, so you’ll probably end up developing a whole new tool set anyway. To begin, these schools will provide some low-end films and tools just to start out with. Eventually, you’ll be expected to purchase your own equipment. In addition to the valuable information and hands-on experience, most schools will provide some sort of certificate showing that you completed the training. This can be very valuable when showing customers that you are an experienced, talented window tinter. You’ll leave with a much greater knowledge of film types, window tinting tools, and installation techniques that will help you thrive in the industry. The first place to look will be locally. Search the internet to see if there are any window tint schools close to you. 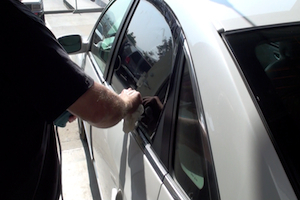 You can also ask local tint shops if they offer any hands-on training. This will be the easiest because you won’t have to do any traveling. However, there may not be any available locally. If not, you’ll have to travel to the closest one you can find. If you have trouble finding a school, contact the people at Windowtinting.com and they should be able to direct you.